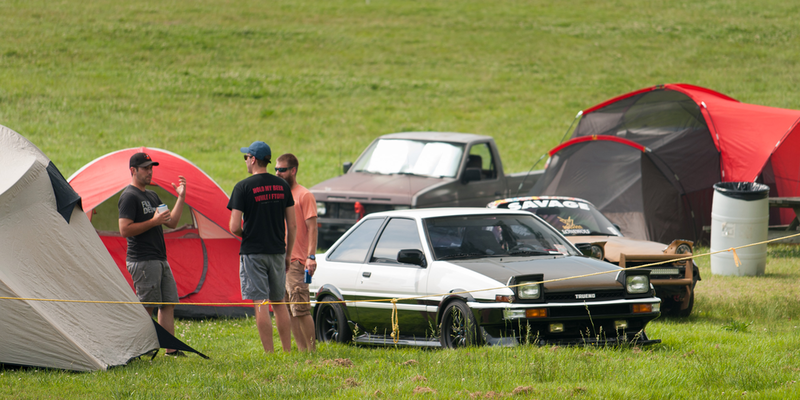 By far one of the best ways to enjoy HyperFEST presented by Grassroots Motorsports is the ability to camp out with your friends at a scenic racetrack like VIR. HyperFEST offers both premium (reserved) and general (non-reserved) camping throughout the property. Some premium camping spots include power, water and sewer hookups, and all premium and general camping spaces have access to VIR’s shower and restroom facilities. To view the VIR Camping Policies for 2019, please click here. Most people that attend HyperFEST choose general camping. General camping is on a first come, first serve basis; and as such, many people arrive right when the gates open on Friday morning to ensure they get their ideal camping spot. So whether you prefer camping trackside and getting that great up close view of the track that comes standard with the loud engine alarm clock the next morning or the family area that is a little more secluded and less rambunctious, it's entirely up to you. VIR has nine (9) premium RV sites in the North Paddock and offer a spectacular view of the down hill Roller Coaster. These sites each cost $50 per night and include access to power, water and sewer hookups. Additional electrical hookups not associated with the nine premium RV sites is available on a first-come, first-served basis and is charged at an additional $30 per event. VIR has 36 reserved spaces located in the Hog Pen turn area of the track – ideal for viewing the Full, North and Grand (also referred to VIRburgring by Car & Driver) Courses. Twenty-three spaces are along the trackside fence and 13 spaces are along the hill top beside the false grid. Each space is 20 feet by 40 feet. VIR recommends bringing blocks, as not all spaces are level. Is there a family friendly camping area? Yes! If you are bringing small children, consider using our Family Camping Area. HyperFEST is a place for people of all ages, but we feel a special area for parents and their small children will help provide a better festival experience for all. Expecting parents are also welcome in this area. You don’t need a special ticket to camp here, just head over there and set up or if you need help finding it, ask a staff member. You can find the Family Camping Area on the left side of this map. I bought a camping pass, do i still need a spectator ticket? Yes, camping passes do not include the price of admission for spectators. All attendees are required to have a General Admission ticket in order to enter the venue. DO I NEED A CAMPING PASS FOR EACH PERSON in my tent? No, unlike other events, HyperFEST and VIR want everyone to be able to enjoy the event as easily as possible. Therefore all you need to purchase is one camping pass per tent and then you're welcome to pile as many people in your tent as comfortably you can (think 10+ clowns in a tiny car). While VIR has 1,300-acres of land, we do ask that you be considerate of others attending the event and not be excessive in your tent city. Car camping sites take up about a 10’ x 30’ area. One vehicle allowed and unlimited friends/tents per site. Tent camping sites take up about a 10' x 15' area as a rule of thumb, but we aren't bringing out a tape measure to verify this. This amount of space generally allows you to place 1-3 tents (obviously it depends on the size of the tents), chairs, table, cooler, etc. comfortably. Again, if you need a little more room, take it. RV camping sites take up about a 20’ x 40’ area. VIR recommends bringing blocks, as not all spaces are level. No, as long as you are relatively confined within your campsite area, you can sleep in a tent, in your car, in a teepee, in a hammock, or on the ground under the stars. Whatever makes you happy makes us happy. Unfortunately campfires and ground fires are not allowed. Fires must be contained in a portable and self-contained off the ground fire pit. Campers must also bring their own firewood. Yes, shower and restroom facilities are located on this map. are there picnic tables we can use? Yes, picnic tables are available onsite for everyone's use. However, we ask that you do not move or relocate picnic tables from there current locations.